To survive in this industry members must clean what their customers are wearing.Business formal continues to decline in workplaces. The suit and tie days don’t appear to be coming back, no matter how much we wish they would. Members who have been to DLI’s school, Clean Show, or any other DLI conference have heard this before. 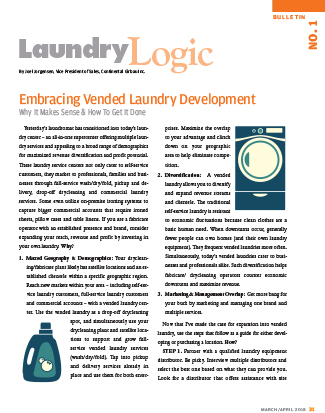 DLI is stepping up to this challenge by offering a new bulletin series called Laundry Logic. It is meant to share information about cleaning casual garments using laundry techniques. This bulletin series will also explore wash-dry-fold solutions and may touch on coin-operated laundry operations. The first installment of this series appears in the March-April 2018 issue. It was contributed by one of our friends at Continental Gibrau. It is also available on DLI’s Drycleaning Encyclopedia. We look forward to sharing more items in this new series to help members survive and thrive in this tough industry.